Home > Manufacturing > Spring 19 features (Lightning) for Manufacturing which would make you do more, prevent problems and generate more insights. If you are a Manufacturer using Salesforce and in Lightning, this post would help you to prepare for key features which would help you to do more, provide insights to your users and prevent problems. Do you have a go-to list view that you want to load as your default list? Now you can. With pinned lists, your admission team can directly go to the prospective student list view of their choice making them do their job quick in the morning. Does your team need to see sales forecasts for 15 months or custom fiscal periods at a glance? Now they can! Previously the limit was 12. For quarterly forecasts, the limit is still 8. Sharing rules give groups of users wider access to records than what organization-wide defaults allow. 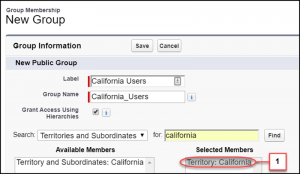 Now you can define sharing rules based on the users assigned to territories. 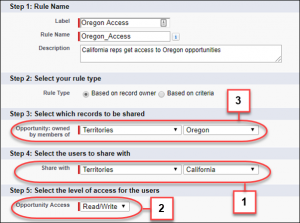 For example, keep opportunities private, except for California reps, who need to view and edit opportunities assigned to Oregon reps. You can also share report folders, dashboard folders, and list views by territory. Now it takes only a few clicks to add all the reps assigned to specific territories to groups or queues. For example, you can add all your Florida reps to your East Coast public group. It’s faster than adding reps one by one and helps you avoid redundant groupings of users. 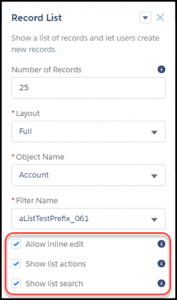 In Salesforce Classic, reps can share the records they own with the users assigned to territories. Sharing this way lets users grant wider access to records than what organization-wide defaults allow. For example, your team’s opportunities are private, but reps assigned to California work deals together, so they share their opportunities with coworkers. Each org can send 5,000 single emails per day to external email addresses. For orgs created in Spring ’19 and later, this daily limit is also enforced for email alerts, simple email actions, Send Email actions, and REST API. If one of the newly counted emails can’t be sent because your org has reached the limit, we notify you by email and add an entry to the debug logs. For orgs created before Spring ’19, the daily limit is enforced only for emails sent via Apex and Salesforce APIs except for the REST API. If you are a new salesforce user, you would send 5000 emails per day and for current customers, it is only applicable for custom code only. Customizable Forecasting is scheduled for retirement as of Summer ’20. After the feature is retired, users can’t access Customizable Forecasting and its underlying data. We encourage you to migrate to Collaborative Forecasts. If you are using Customizable forecasting, you need to move to Collaborative forecasting quickly. If your customers choose Email Opt Out or the Don’t Market email privacy setting, your company should send them non-commercial emails only, such as product shipping updates and service plan changes. Previously, Salesforce didn’t account for these settings and didn’t send any emails to these customers. You can prevent reps from sending email to customers with these privacy settings by removing their Send Non-Commercial Email permission. If you are GDPR compliant, now you can have sales reps send transactional emails to customers when the send Non-commercial email option is turned on. With the new flow builder coming up, the old cloud flow designer will be retired since it is built in Flash. So stay on top with the new cloud flow builder which is faster, much simpler to use. Help reps keep track of emails that aren’t delivered by returning bounced messages to them. When an email bounces, it is now sent as an email attachment to the sender’s email address. Returning bounced emails as attachments comply with security measures that help to protect against fraudulent emails. How to use it: For companies handling privacy emails, instead of now handling the bounced emails to a separate mailbox, the sender will be notified on this and he can talk to the contact or lead and fix the email saving time. If you using Gmail for your emails, Sales reps can now easily access the matching Salesforce data while viewing or creating an event in Calendar view. No more double-clicking the event to drill into the details to see Salesforce data. Previously, sales reps could log emails from Microsoft® Outlook or Gmail to contacts, leads, and person accounts in Salesforce that matched an address in the To or CC fields in the email. Because an email can include important information, reps can now log messages to any people record, ensuring that pertinent information is recorded in Salesforce. Sales reps can search for other people using global search in the Gmail integration pane. Emails logged to other people records are included in the record’s activity timeline. How to use it: If you are using lightning for outlook and Gmail, you can now allow your users to send emails using salesforce email templates easily. User can select the template and send the email from your favorite device. This would help you to use sync campaigns between salesforce and pardot and also choose the right records to be synced between pardot and salesforce. How to use it: This is the most important reason why you should sync campaigns from Salesforce to Pardot. Present the best options to your agents and customers, such as a discount, a repair, or a suggested next step. Apply your company’s business rules, predictive models, and data to refine and personalize offers and actions. Einstein Next Best Action refines many possibilities into a few spot-on recommendations, making it easy to deliver a customized service experience. This would be a paid feature which you should check with your account rep on it. To provide more consistent support, every user with a Service Cloud license now has a 360-degree view of a customer’s support history and can see past chat transcripts. Previously, a support agent needed a Live Agent license to view chat transcripts. So when a customer chatted with an agent and then followed up on another channel, like email, the new agent couldn’t always see the full history. A Live Agent license is still required to deliver service using Live Agent in the Lightning Service Console. 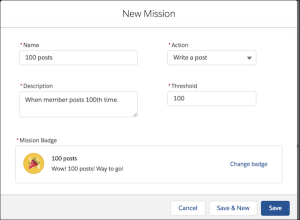 Increase Engagements by automating badge creation with Missions feature. Game mechanics, such as using badges, are a great way to get your users involved in your community. However, assigning badges manually can be time-consuming. Instead, use the Missions feature to assign badges automatically. Community managers have their say in what action earns a badge and when it can be awarded, and then Missions takes care of the rest. And members can see which badges they haven’t yet earned, inspiring action. You can configure the Ask button to block users from choosing a new topic when they ask questions under a selected topic. For example, a user selects the topic New Products and clicks the Ask button. But then in the Posting to field, the user selects another topic. To avoid potential confusion about the location of their question, use the new property to help your users keep focus and easily find their way back. 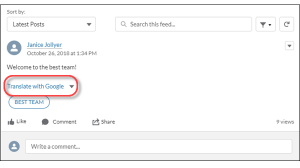 Why you should use this feature: This would help you to create topic experts which would be helpful for self-service and engagement. 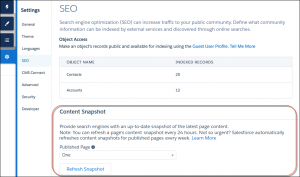 Salesforce takes a weekly snapshot of your community’s published public content, which works well for most updates. But let’s say you update a page’s content with important, time-sensitive information, such as price changes for a flash sale. Now, instead of waiting for the weekly update, you can take a snapshot every 24 hours to refresh the page content served to search engines. When members have questions, put your best information forward, and let them help themselves. Configure the Ask and Contact Support & Ask buttons to respond with pertinent articles and previous answers when users ask questions. Members can cancel a question when the response hits the mark, or they can continue to post their question. 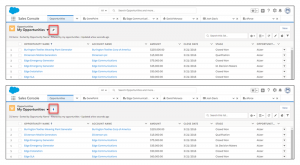 Have your resellers and distributors update leads in bulk and use predefined salesforce list views. Not only can you do so much more from a record list these days, but you can also control which options are available. New controls let you allow folks to edit the record list without sending them to the record detail, show or hide the actions buttons, and show or hide the search bar. Why you should use this feature: This would help you to drive more engagements with your distributors and resellers. Curious about how effective your audience targeting has been? Wondering whether audience members are clicking their target content? Google Analytics tracks the click path of your members so you can understand how different audiences behave when they visit your community. Use this information to help drive engagement. Why you should use this feature: This is a feature which should be used right away. You can view your audience engagement using google analytics. If you have multiple distributors and they need different levels of access to your object records, sharing rules can get complicated. Easily create sharing relationships between partner accounts and protect confidential data by sharing only select information. Channel account managers can use account relationship data sharing rules and account relationships to target how information is shared and who it’s shared with. 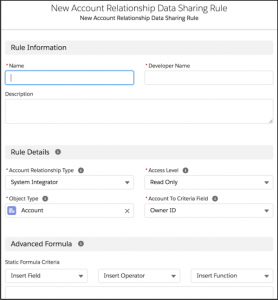 Here is an example of creating an account sharing rule. Here is an example of how orders can be shared to your distributors based on the account sharing rule. We’ve added async email verification for community self-registration. Async email lets users verify their email address at any time. You send users a verification link in an email message. Users can verify their email address by clicking the link when it’s convenient. Welcome new members by giving them access to your community without delay. You can also customize the email message so that users can recognize your brand. Why you should use this feature:This would allow you to have your community members to login and use the community if there is a challenge with email issues. When you use the Login Discovery page type in My Domain and Communities, you can localize the login prompt with a custom label. You can also localize custom login error messages in Apex. For example, you can alert users when they try to log in with a personal email address instead of their corporate email address. Why you should use this feature: With this feature, you can create custom error messages with multilanguage messages using custom labels. To take the guesswork out of your community’s security design, you can see what your Lightning community looks like to visitors who haven’t logged in. Previously, when you previewed a community, you were viewing it as an authenticated user, so it was difficult to know exactly what guest users could see. Why you should use this feature: You can now preview your community on how anonymous users can see your community. When your users have a common interest but not a common language, you can help. Use Community Builder’s new translation setting to put a Translate with Google menu on every feed item. Translate posts, questions, comments, answers, and replies. Over 50 languages are available to get people talking. 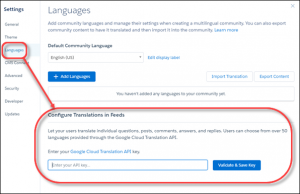 Translations are offered through a Google Cloud Translation API key that you provide. Why you should use this feature: If you have international distributors and customers , they can now colloborate with you in their language increasing engagement and adoption. You can create new forms with standard picklist feature for country and state and create quick forms for your users. In a sandbox org, you can view the references to a custom field, such as in a formula, layout, or Apex class, with the click of a button. The new Where is this used? button lists where a field is used and where changes to the field appear. You can communicate changes to others who use the field in a formula or other context. How to use: This is one feature which admins would love and help you save time on impact analysis. This does not do reports and dashboards yet but will be covered in future. You no longer have to load the change set’s detail page to initiate these operations. We added links to the Inbound Change Set page that you can use to initiate validation and deployment operations for both deployed and undeployed changesets. If the change set has been deleted from its source org, these operation links aren’t available. If deployment of the changeset is in progress, these operation links aren’t available until after the deployment completes. We also added links to the Outbound Change Set page that you can use to upload or clone changesets. If the changeset doesn’t contain any components, the Upload link isn’t available. Sandbox cloning simplifies the management of multiple concurrent work streams in your application life cycle. Clone an existing sandbox for each type of work, such as development, testing, and staging. As you move from one development stage to the next, clone an existing sandbox rather than using your production org as the source. This pattern simplifies the customization of individual sandboxes. Your colleagues can easily clone individual sandboxes instead of sharing one sandbox to avoid stepping on each other’s toes. The Force.com IDE plug-in for Eclipse is in a maintenance-only state. We will still provide support through our official channels for the product until its retirement date on October 12, 2019, but the only updates will be for critical security issues that arise before the retirement date. Developers now should use Visual Studio Code for development going forward. 1. Please use the pinned list view feature and train the users to create their own list view of leads, accounts and contacts so that they can login and get their primary task done. 2. If you are using gmail or outlook , plan to have the users send emails using email templates right from gmail and outlook. 3. Be prepared to learn how to use the new flow builder instead of the old flow designer. As always feel free to post your comments on your favorite feature or email me at buyan@eigenx.com for further questions. Spring 19 features (Classic) for Manufacturing allowing you to do more, prevent problems and generate more insights.